HERDIM - German made version of a Stanley 101 made originally between 1877 and 1962. Body measures 85 x 32mm and blade thickness 2.0 mm HRC 60. The tool enjoyed great popularity among musical instrument and fine furniture makers due to its small size and excellent function. The Herdim No. 101 reproduction is based on that classic, is however fitted with a thicker blade to improve performance. 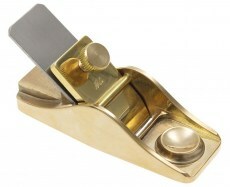 The thicker walls of the brass body give the plane the necessary heft even when performing detail work, make it very comfortable to use and avoids rust spots on the workpiece. Minimised side faces to work close to the edge, thick sole, which can be worked if required. Brass body and high quality blade, hardened to approx. 60 HRC.